Chris Beckett's first collection of short stories (as emphasized on the back cover of The Peacock Cloak ) won the 2009 Edge Hill Prize for short stories, which allegedly surprised the jury ("none of whom knew they were science fiction fans beforehand," says the Edge Hill Prize website) as much as those science fiction fans who feel that the world of literary prizes has it in for us. His last novel Dark Eden (one of my favorites of last year) was shortlisted for the BSFA award, was the Sunday Times best SF novel of the year and won the Arthur C. Clarke award. So no pressure, then, for this second collection. As Beckett points out in his introduction, the thirteen stories here were written over the four years since The Turing Test was published, as opposed to the sixteen years which encompassed the publication history of the previous collection. Fortunately, it is still a fine collection. Many SF writers seem to have their own territory marked out—neo space opera, dystopia, far future, near future, imaginative aliens; whatever the territory it is something which they can do well and can claim as their own and can be identified by. Beckett's strength is that he has more than one of these territories and is equally adept at exploring them. For example, the first story, "Atomic Truth," is Beckett's near-future extrapolation of our world in which the SF marker ("novum," if you like) is the "bug eyes": something like the almost-inevitable next step enhancement to our senses and social connection. We meet Jenny, PA to a senior partner in a law firm and in the early stages of a potentially abusive relationship, putting on "a pair of large hemispherical goggles" (p. 9) to connect to the virtual world as everyone does as automatically as they now pick up their smartphone. Everyone, that is, apart from Richard Pegg, who "didn't need bugs to provide him with phantoms and visions and voices. He had to take pills, in fact, to keep that stuff at bay" (ibid). Richard is a misfit, a loser in this society, but it is his act of kindness to Jenny which is the story’s pivotal moment. His vision of a white deer is his moment of "atomic truth," similar to that of the white hart followed by Lemmy Leonard in "The Perimeter" ( The Turing Test ) which seems to be set later in the same world (in "Atomic Truth" London's population has not retreated as far into the virtual and we are told that the "Urban Consensual Field" which powers this virtuality is imminent but not yet active). The similar future of the two Clarissa Fall stories in the earlier volume ("The Perimeter" and "Piccadilly Circus") is also foreshadowed in "Rat Island" in the later one, where we also meet Clarissa as a child, although the story is narrated by her brother Tom, obsessively recording with his camera the world as it is before the bug-eye wearers and the Urban Consensual Field change the nature of "reality" forever. Is the unnamed "weirdo" (p. 128) noted by Tom the protagonist of "The Perimeter"? One of Beckett's strengths is the interweaving of such threads. There is more such in, for instance, "The Famous Cave Paintings on Isolus 9," which seems to reprise the spiritual desolation observed by the narrator of Turing's "Monsters," this time brought much closer to home as what seems to be the great and enduring love of his life unravels under the truth of his own shallowness. Our protagonist is viewed here from the outside ("My uncle Clancy" (p. 101)): such shifting of viewpoint is another aspect of what makes Beckett such a rewarding storyteller. Another source of reward, as noted above, is his claim to more than one of the "territories" of SF. If "Atomic Truth" and "Rat Island" offer detailed extrapolations of our present (not to tell us what will happen next but to allow us to see this present in a new light), so stories like "Johnny's New Job" use dark humor to illuminate our world. Another story clearly drawn from Beckett's observations of social work and its consequences, this story gives us what many people want: the punishment of a case of "Welfare Knew and Did Nothing" (the tabloid-style capitals accurately reflect the tone of the story) by the naming and shaming of the welfare worker whose "neglect" resulted in the death of a little girl. After the public lynching of the culprit, lumpen-proletariat observer Johnny, parroting lines like "If we don’t go after the bastards that let her die, that poor little girl will have died for nothing" (p. 53) in order to cement his place in the crowd, is recruited by the Press Gang. Because in this system there is always the need for more Welfare Workers . . .
Another dystopian near-future is offered in "Greenland," in which a near future Britain is wracked not only by climate change but by the waves of refugees escaping the horrors of the south, each wave prepared to take lower wages and worse conditions than the previous if they can get past the machine-guns on the coast. The narrator, Juan, is offered the chance of a visa for Greenland in return for taking part in medical experiments. But Beckett also takes a much broader, wide-screen baroque approach, albeit with darker linings. "The Famous Cave Paintings" takes place partly on a world isolated from a Galactic Empire for millennia, and is partly focused upon the way its religion has reflected that isolation. "The Caramel Forest" and "Day 29" give us one of Beckett's strange worlds in the tradition of Dark Eden , this time Lutania, inhabited by "goblins" who seem to communicate (or defend themselves; no one is sure) by reflecting the inner voices, the inmost thoughts or fears, of whoever approaches. In "The Caramel Forest" Cassie takes her younger brother into the forest to escape her mother's increasingly hysterical terror of her surroundings. "Day 29" shows us more of this world, but the central story is that of Stephen, about to leave the world by means of a matter-transmission technique which results in the erasure of the memory of up to forty days before transmission. Keeping his diary, as travelers do so that there is a record of this blank space, Stephen becomes increasingly aware that he can never fully overcome the amnesia. His entries become increasingly laconic and surly, like messages to himself from an adolescent persona "asked what he had done at school that day" (p. 153). "The thing about surly adolescents was that, when pressed to tell, they only told the empty shell. What was inside, what was real to them, they kept back" (p. 154). "The Desiccated Man" also involves interstellar travel and the meaningless life and shriveled heart of its protagonist Stone, who amuses himself by killing one of his passengers, a family of "Tardies" whose mode of traveling the vastness of space is to dehydrate themselves and slow down their life processes. Inevitably, not all would rehydrate successfully: "she might not have woken anyway" becomes Stone's pathetic excuse (p. 202). There are also stories of what might be Beckett's most effective and well-known semi-sequence, the sheaves of alternative universes which can be crossed by means of drugs or "seeds." "Poppyfields" brings a runaway teenager into the world of an insecure "Mr Average" who is being turned into "Mr Right" by his manipulative and social-climbing girlfriend. If both Angus and his appalling partner are stereotypes in this social comedy, this because the location of Poppyfields itself (a derelict landfill waiting to be turned into housing units) is liminal, a soap-bubble, a membrane between countless universes. A version of this, although no means of "crossing" is apparent, is "Our Land," in which a schoolteacher somehow finds himself in a Britain where Celtic returnees to the promised land of "Logres" have taken over their "homeland" leaving the English in a Bantustan state, oscillating between protest branded as terrorism and submission to an arrogant extremism: "'I really can't understand what these Saxons keep whinging about!' he exclaimed. 'They already have a country. It's called Saxony. The clue is in the name. Why don't they go back to where they came from?'" (p. 173). "THERE IS NO SUCH PEOPLE AS 'THE ENGLISH'" (p. 176). In part a dig at English complacency, the story's finely judged tone is heightened in scenes like the uneasy relationship between Richard and Colonel Rhys, a "secular" Brython who starts by wishing "all this nonsense" (p. 75) would blow over and ends by wishing that "you people" would find somewhere else to live (p.186). Right down to the last line, the story keeps undermining our sense of certainty. Two standalone stories complete the book, and for some reason made me think of Lord Dunsany. 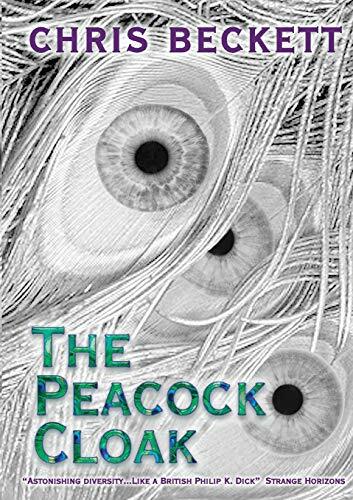 The second story in The Peacock Cloak , "Two Thieves," reminds me of a science fiction version of a Dunsanian comic fantasy like "The Probable Adventure of the Three Literary Men." Here the two thieves Pennyworth and Shoe are sentenced to Last Resort, a remote penal colony, where they are sent to an archaeological site dating back to the days of the Old Empire. There they find a spatial gateway to another world and, eventually, a chamber stacked with boxes of diamonds. But that's not the end of it. This is probably the funniest story in the book, and a sign that Beckett is a master of slapstick. There will be more about this pair, I'm sure. The final (and title) story, though, is the most individual. Its likeness (for me) to the Dunsanian wry epics of godhood is very possibly a surface detail (caused possibly by the fact that one of the roots of the story is, according to Beckett's website, a Middle Eastern legend), but there's a sense of melancholy about it which draws it closer to fantasy than SF. Tawus is a god, or a godlike far-future human in a pocket universe created by Fabbro, who has incarnated himself as six brothers and sisters, of whom Tawus is one. It is Tawus who moves the pastoral world in which they find themselves, inhabited by humans who imagine that they have always lived there in their villages, tending their crops and minding their cattle, in the direction of technology, cities, states, and empires. Now Tawus is facing Fabbro, the last rebel against an omnipotent creator. Like Lucifer facing God, Tawus really has no option—either to revolt or to come to take part in the final debate. Chris Beckett has to be one of our finest SF writers. His stories are always beautifully constructed, but at their hearts, there is always something unnerving. I called "Two Thieves" slapstick, for instance, and it is, but there is also a moment of grotesqueness in the story drawn from the logical consequences of hiding a cache of diamonds about your person. Similarly, "Day 29"'s suggestion that the one person you really cannot communicate with might be yourself makes the story one which stays long in the mind after reading. It is, though, his ability to take some of the varied settings of SF and breathe fresh air into them which stands out. It is as if these settings are being presented as new even as we readers know full well they aren't: there are so many stories of matter transportation, of alien worlds, and of personal angst in the wastelands of space. But Beckett is never satisfied simply with the setting. There is never a sense, with Beckett, that he is recycling cliché, giving us the secondhand. Perhaps this is why those non-science fiction fans of the Edge Hill Prize were so taken with the stories: they were so evidently science fiction, but not the oversimplified generic SF that they thought they knew. We SF fans know, of course, that much SF is not like that, but it's certainly true that much of the SF we like will be waving at us, attracting our attention because it speaks our language. There's nothing necessarily wrong with that, but The Peacock Cloak isn't like that. We recognize these stories as SF, but they challenge us, they make us think about them; they explore human dilemmas and taken together, they explore different kinds of storytelling, different human conditions, and different imaginary universes. Publication of this review was made possible by a donation from Sam Fitzpatrick. (Thanks, Sam!) To find out more about our funding model, or donate to the magazine, see the Support Us page. Andy Sawyer is librarian of the Science Fiction Foundation Collection at the University of Liverpool Library, and a widely published critic. For ten years he was Course Director of the MA in Science Fiction Studies offered by the University's School of English. He is Reviews Editor of Foundation: The International Review of Science Fiction . He recently co-edited (with David Ketterer) Plan for Chaos , a previously unpublished novel by John Wyndham and (with Peter Wright) Teaching Science Fiction in the Palgrave "teaching the New English" series. He was the 2008 recipient of the Clareson Award for services to science fiction. Andy Sawyer is a retired librarian, researcher, critic, and reviewer of SF. From 1993-2018 he was librarian of the Science Fiction Foundation Collection at the University of Liverpool Library, where he also taught courses on SF, and was Reviews Editor of Foundation: the International Review of Science Fiction. He was Guest Curator of the British Library Exhibition “Out of This World: Science Fiction but Not as You Know It” (20 May-25 Sep 2011), and an advisor to the “Into the Unknown” exhibition at the Barbican Centre London (3 June-1 Sept 2017). He was the 2008 recipient of the Science Fiction Research Association’s Clareson Award for services to science fiction. He is currently researching science fiction of the 1950s, the life and work of Jane Webb Loudon, and how to play “Science Fiction—Double Feature” on the ukulele.